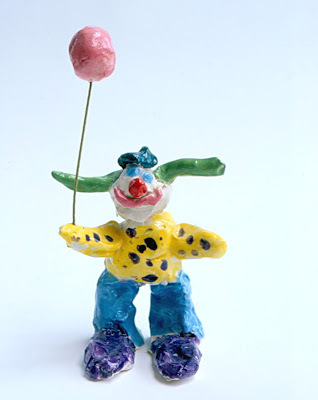 The children use clay to make colorful circus clowns. For ages 3 to 6. Plan 2 sessions. Click here to view additional information about working with clay in a printer-friendly format. Programs from the Ringling Brothers and Barnum & Bailey circus performances are a good source for pictures of real-life clowns. Check the clay several days ahead to be sure it is of good workable consistency. Plan to have the clay slightly wetter than usual for small hands to work with. Wedge the clay into small grapefruit-sized balls, planning one for each child plus a few extra. Set out tenpenny nails, containers of water, and clay. Have available the pictures of circus clowns to discuss their characteristics with the children. Explain to the children that they will be using clay to make circus clowns. Warn them that this project will take several weeks to complete since the clay must be dried slowly and fired in the kiln several times. Let the children know that before clay projects are fired in the kiln, they are referred to as greenware. After the first firing, they are referred to as bisque ware. After the bisque ware is painted, it is fired in the kiln again. It is important to make sturdy pieces that will hold together while going through the firings. Demonstrate how to attach pieces of clay by using a tenpenny nail to scratch the surfaces to be joined, applying a small amount of slip or water, and pressing the two pieces together. Be sure the children understand that if they don’t scratch and slip their attachments, the pieces of clay might fall apart as they dry. The children should plan to make their clowns from one ball of clay by breaking off pieces as necessary. Be sure they understand that their clowns need to be built upright and three-dimensional, or viewable from all sides. Show the children the examples of circus clowns. Talk about their over-sized shoes, baggy pants, bow ties, round red noses, silly hair, and often funny hats. Distribute the clay and have the children build their clowns. Note: Make an air-release hole in the bottom of any piece which is more than 1½ inches thick. Dry the clowns very slowly under plastic wrap, loosening the wrap gradually. When completely dry, bisque fire the clay pieces in a kiln. Have available the pictures of circus clowns. Show the examples of the circus clowns again, this time pointing out the bright colors and patterns of their clothes. 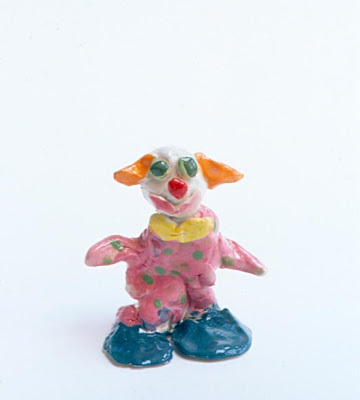 Explain to the children that they will be adding color to their clay clowns with underglazes, which is paint for clay. Show the children that they can apply designs directly on top of the dried underglazes. Be sure they understand that the last color painted is the one that will show. 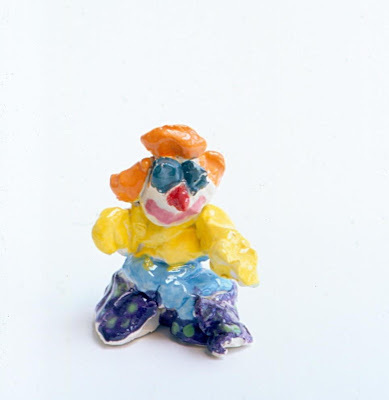 Have the children paint their clowns with the underglaze, encouraging them to include patterns and bright colors. Note: Let the underglazed pieces dry overnight. Apply a coat of clear glaze, let dry, and glaze fire in a kiln. When working with 3- and 4-year-old children, moisten the clay more than usual, since they do not have as much strength in their hands. I also don’t introduce the scratch and slip method to this age. Using very moist clay is usually enough to hold the pieces together if you dry the clay slowly. This is a good project for small children because the oversized shoes and baggy pants make it easy to balance the clay figures in standing positions. Keep reminding the children how easily bisque ware can be broken. Opaque, rather than transparent, underglazes are best to use with young children. Mistakes are easily covered up and designs can be painted directly on top of the bottom color. Glaze is more complicated to work with than underglaze, so I apply the clear glaze for children between the ages of 3 and 6. The balloon in the work above was added by putting a small deep hole in the balloon and the clown's hand before drying the clay. After the glaze firing, put white glue on each end of a piece of wire, stick it into the holes, and let dry. Do the clowns stand upright without support? Are they viewable from all sides? Discuss some of the characteristics of the clowns that make us laugh. The clay for my clown won’t stand up. It keeps falling over. I was making green polka dots on my clown’s shirt and I dripped some on his shoes. I’m making my clown’s hair stick straight up! Be sure to make the legs of your clown's pants thick and attach them to your big clown shoes. If you dripped underglaze where you don’t want it, just cover it up with the color you want. Remember that the last color of underglaze that you apply is the color that will show. Clowns have funny hair. The sillier, the better. Sometimes they have crazy hats too.